Name Variation Sigri Johnson Lund was also known as Sigrid. Name Variation Sigri Johnson Lund was also known as Sarah. Married Name 26 March 1877 As of 26 March 1877,her married name was Solem. Sigri Johnson Lund was born on 17 June 1854 at Norway. She was the daughter of John Gunnarsen Lund and Gertrude Thoresdatter Kleven. Sigri Johnson Lund married Anders Olai Solem, son of Ole Mathias Andersen Stubhaug and Danille Ingvaldsdtr Solem, on 26 March 1877. Sigri Johnson Lund died on 1 September 1934 at age 80 Mrs. Anders O. Solem passed away at her home in Union county, S. D., Saturday, September 1, 1934, due to the infirmities of advanced years, at the age of 80 years, 2 months and 15 days. Sigri Johnson Lund, daughter of John and Gjertru Lund, was born in Stordahl, Norway, June 10, 1854. She came to Goodhue county, Minn., with her parents in 1865, at the age of 11 years. Three years later they came to Union county, S. D. She was a member of Rev. Nessa's first confirmation class in the St. Paul congregation. On March 26, 1877, she was united in marriage with Anders O. Solem. In the fall of the same year they bought the present home, where they have resided ever since, with the exception of nine years in Elk Point. She is survived by her husband and four children, Daniel Solem of Little Fork, Minn; Emelic (Mrs. Otto Sorsdahl) of Midale, Sask., Canada; George Solem, of Chicago; Agnes (Mrs. Gust. Abraham), at home, to mourn the loss of this loving wife and mother, besides nine grandchildren and two great grandchildren. Mrs. Solem was a charter member of the St. Paul Ladies' Aid, where she was an active member for forty years. She will be greatly missed and mourned in that community. Funeral services were held Monday afternoon, last week at the home and in the St. Paul Lutheran church, conducted by Rev. W. I. Aamoth. Interment was in the St. Paul cemetery. She was buried after 1 September 1934 at South St. Paul Cemetery, Union, South Dakota, Grave 2, Lot 25, Block 2, Section 2. Sigri Johnson Lund immigrated in 1865. She immigrated with John Gunnarsen Lund and Gertrude Thoresdatter Kleven in 1865. Sigri Johnson Lund and Anders Olai Solem were naturalized in 1880. [S247] U.S. Federal Census 1870 U.S. Federal Census, by Ancestry.com, Year: 1870; Census Place: Brule, Union, Dakota Territory; Roll: M593_118; Page: 107B; Image: 218; Family History Library Film: 545617. [S246] U.S. Federal Census 1880 U.S. Federal Census, by Ancestry.com, Year: 1880; Census Place: Spink, Union, Dakota Territory; Roll: 115; Family History Film: 1254115; Page: 403A; Enumeration District: 5; Image: 0005. [S245] U.S. Federal Census 1900 U.S. Federal Census, by Ancestry.com, Year: 1900; Census Place: Spink, Union, South Dakota; Roll: T623_1555; Page: 7A; Enumeration District: 340. [S244] U.S. Federal Census 1910 U.S. Federal Census, by Ancestry.com, ED430. Dwelling 62. [S243] U.S. Federal Census 1920 U.S. Federal Census, by Ancestry.com, ED248. Dwelling 123. [S250] U.S. Federal Census 1930 U.S. Federal Census, by Ancestry.com, ED64-15. Dwelling 13. Name Variation Gurine Emelie Solem was also known as Emelie Gurine. Married Name 29 January 1908 As of 29 January 1908,her married name was Sorsdahl. She was the daughter of Anders Olai Solem and Sigri Johnson Lund. Gurine Emelie Solem married Otto A. Sorsdahl, son of Andrew Svenson Sorsdahl, on 29 January 1908. Gurine Emelie Solem died on 17 February 1954 at Canada at age 73. 1916 Weyburn, Saskatchewan, Canada Gurine Emelie Solem appeared on the census of 1916 in the household of Otto A. Sorsdahl at Weyburn, Saskatchewan, Canada. [S9] South Dakota, South Dakota Birth Records South Dakota, State File Number: 659483 (unknown file date). Married Name 24 February 1927 As of 24 February 1927,her married name was Abraham. Agnes Stephanie Solem died on 24 July 1988 at Morningside Manor, Alcester, Union, South Dakota, at age 94 Agnes Abraham, 94, Elk Point, died Sunday in Morningside Manor Nursing Home in Alcestor. Agnes Solem was born March 5, 1894, in Union County. She attended South Spink School north of Elk Point and Augustana Academy, Canton. She married Gust Abraham on Feb. 24, 1927, in rural Elk Point. They farmed until 1950 when Mr. Abraham retired. They moved to Phoenix, Ariz., in 1959. Mr. Abraham died in 1967. Mrs. Abraham moved back to Elk Point in 1976. She was a member of Brule Creek Lutheran Church in rural Elk Point. Survivors include one son, Gerald, Los Vegas, Nev. Services will begin at 10am Thursday in Brule Creek Lutheran Church with burial in the church cemetery. Visitation will be at 8am to 10pm today with the family present from 7 to 8 pm at Anderson Funeral Home in Elk Point. She was buried on 28 July 1988 at Brule Creek Cemetery, Union, South Dakota. Agnes Stephanie Solem obtained US Social Security Card at California; Last residence Alcester, Union, South Dakota. She and Gustav Andreas Abraham lived in 1959 at Phoenix, Arizona. Agnes Stephanie Solem and Gustav Andreas Abraham lived in 1964 at Meza, Arizona. Agnes Stephanie Solem migrated in 1976 at Elk Point, Union, South Dakota. [S9] South Dakota, South Dakota Birth Records South Dakota, State File Number: 695868 (unknown file date). Name Variation John Gerhart Groon was also known as J. G.
Name Variation John Gerhart Groon was also known as John Gerd. Nickname John Gerhart Groon also went by the name of Gerdy. John Gerhart Groon was born on 16 January 1874 at Germany also reported as 16 Jan 1875. He was the son of Gerhart J. Groon and Anna Von Hagel. John Gerhart Groon married Nellie Johnson, daughter of Jens Johnson and Hannah Bengtsdotter, on 4 July 1900 at Elk Point, South Dakota. John Gerhart Groon immigrated with Gerhart J. Groon and Anna Von Hagel in 1875. On 12 September 1918 at World War I Draft Registration, Union, South Dakota. On 4 July 1950 at Union Creek Lutheran Church J G and Nellie (Johnson) Groon 50th wedding anniversary. [S289] Iowa, Lemars Semi Weekly Sentinel (Le Mars, Iowa), Lemars Sentinel (Le Mars, Iowa) > 1955 > April > 27. Page 8. [S246] U.S. Federal Census 1880 U.S. Federal Census, by Ancestry.com, NA Film Number T9-0359. Page 71C. ED171. Dwelling 94. [S245] U.S. Federal Census 1900 U.S. Federal Census, by Ancestry.com, ED339. Dwelling 109. [S244] U.S. Federal Census 1910 U.S. Federal Census, by Ancestry.com, ED429. Dwelling 37. [S243] U.S. Federal Census 1920 U.S. Federal Census, by Ancestry.com, ED251. Sheet 6A. Stamp 264. Dwelling 112. [S250] U.S. Federal Census 1930 U.S. Federal Census, by Ancestry.com, ED64-14. Dwelling 106. Married Name 4 July 1900 As of 4 July 1900,her married name was Groon. Nellie Johnson was born on 4 July 1882 at Union, South Dakota. She was the daughter of Jens Johnson and Hannah Bengtsdotter. Nellie Johnson married John Gerhart Groon, son of Gerhart J. Groon and Anna Von Hagel, on 4 July 1900 at Elk Point, South Dakota. On 4 July 1950 at Union Creek Lutheran Church J G and Nellie (Johnson) Groon 50th wedding anniversary. [S288] Iowa, Lemars Daily Sentinel (Le Mars, Iowa), Lemars Daily Sentinel (Le Mars, Iowa) > 1962 > June > 27. Page 1. Name Variation Gerald Clifford Groon was also known as Clifford. Gerald Clifford Groon was born on 26 September 1908 at South Dakota. He was the son of John Gerhart Groon and Nellie Johnson. Gerald Clifford Groon died on 26 October 1988 at age 80. Gerald Clifford Groon obtained US Social Security Card at Iowa; last residence Alcester, Union, South Dakota. 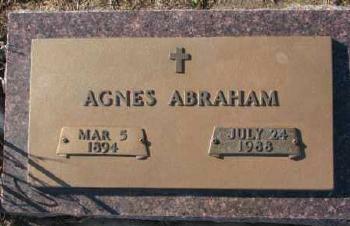 Name Variation Nona Mae Abraham was also known as Abrahamson. Married Name 18 August 1946 As of 18 August 1946,her married name was Arney. Nona Mae Abraham was born on 23 February 1926 at Spink, Union, South Dakota. She was the daughter of Arthur Matthew Abraham and Hannah Wilhelmina Groon. Nona Mae Abraham was baptized on 18 April 1926 at Brule Creek Lutheran Church, Union, South Dakota. 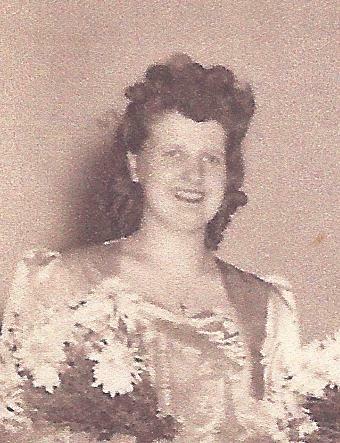 Nona Mae Abraham married Athel Vincent Arney, son of Lawrence Corwin Arney and Eliza Verna Vincent, on 18 August 1946 at Riverside Lutheran Church, Sioux City, Iowa. Nona Mae Abraham died on 12 April 2013 at Lower Lake, Lake, California, at age 87. Nona Mae Abraham was a accountant. She had zero children. She and Athel Vincent Arney lived in 2002 at Sun City West, Arizona. Nona Mae Abraham and Athel Vincent Arney lived in August 2009 at Sun City West, Arizona. [S250] U.S. Federal Census 1930 U.S. Federal Census, by Ancestry.com, ED97-35. Dwelling 179. Nickname Gerald Orville Abraham also went by the name of Jerry. Gerald Orville Abraham was born on 8 May 1932 at Sioux City, Woodbury, Iowa. He was the son of Arthur Matthew Abraham and Hannah Wilhelmina Groon. Gerald Orville Abraham died on 2 August 2009 at age 77 Abraham, Gerald "Jerry" Age 77 - Aug 2, 2009 Omaha. Preceded in death by parents; grandson, David Murphy. Survived by wife, Doris Abraham; children, Donald (Karen) Abraham, Phoenix, AZ, Cheryl Robinson, Saukville, WI, Barbara (Tom) Woodworth, Omaha, Connie (Ed) Murphy, Omaha; sister, Nona (Athel) Arney, Sun City West, AZ; 11 grandchildren. Celebration of Jerry's life will be Friday, 11am at Braman Mortuary (Southwest Chapel). VISITATION Thursday, 5-8pm at the Mortuary. Interment Evergreen Cemetery. Visit bramanmortuary.com for online condolences. Gerald Orville Abraham obtained US Social Security Card at Iowa; last residence Omaha, Douglas, Nebraska. Peter Oscar Peterson was born on 23 September 1871 at South Dakota. He married Mary Jane Petersen circa 1899. Peter Oscar Peterson died on 28 February 1954 at age 82. [S243] U.S. Federal Census 1920 U.S. Federal Census, by Ancestry.com, ED252. Dwelling 17. [S250] U.S. Federal Census 1930 U.S. Federal Census, by Ancestry.com, ED64-15. Dwelling 124. Nickname Mary Jane Petersen also went by the name of Mamie. Married Name circa 1899 As of circa 1899,her married name was Peterson. Mary Jane Petersen was born on 16 December 1871 at Illinois. She married Peter Oscar Peterson circa 1899. Mary Jane Petersen died on 28 November 1953 at age 81. Name Variation Christian Lauritsen Klostergaard was also known as Christ L.
Name Variation Christian Lauritsen Klostergaard was also known as Chris L.
Christian Lauritsen Klostergaard was born on 18 September 1896 at Humlum, Denmark. He was the son of Jeppe Jensen Lauridsen and Eva Marie Kirstine Hansen. Christian Lauritsen Klostergaard married Marie Ebsen, daughter of Martin Peter Ebsen and Martine Hermenson, on 25 February 1925 at Lincoln, South Dakota. Christian Lauritsen Klostergaard died in 1947. [S250] U.S. Federal Census 1930 U.S. Federal Census, by Ancestry.com, ED42-22. Dwelling 105. Name Variation Marie Ebsen was also known as Ebson. Married Name 25 February 1925 As of 25 February 1925,her married name was Klostergaard. Married Name before 1958 As of before 1958,her married name was Milliken. She was the daughter of Martin Peter Ebsen and Martine Hermenson. 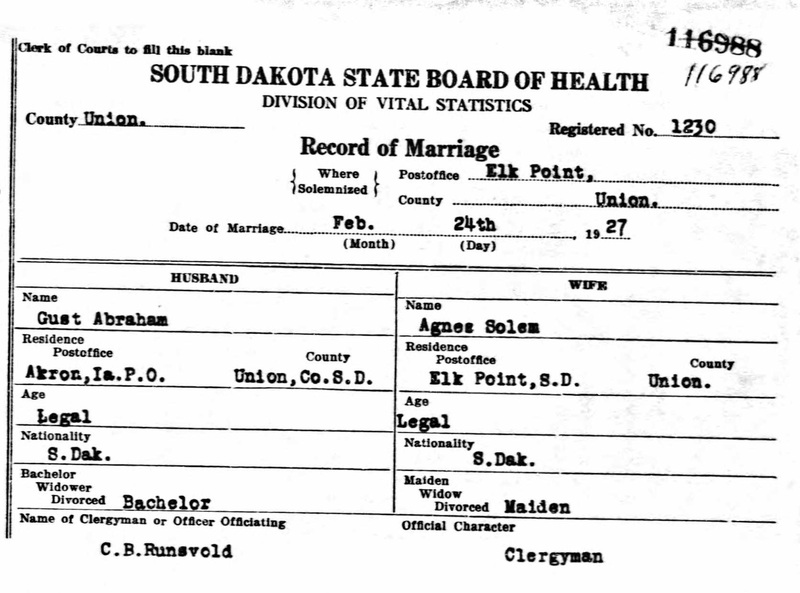 Marie Ebsen married Christian Lauritsen Klostergaard, son of Jeppe Jensen Lauridsen and Eva Marie Kirstine Hansen, on 25 February 1925 at Lincoln, South Dakota. Marie Ebsen married A. K. Milliken before 1958. Marie Ebsen died in November 1998 at age 95. Marie Ebsen obtained US Social Security Card at California; last residence Beresford, Union, South Dakota. [S9] South Dakota, South Dakota Birth Records South Dakota, State file number: 611615 (unknown file date). 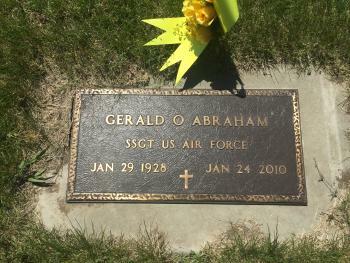 Gerald Orris Abraham was born on 29 January 1928 at Beresford, Union, South Dakota, also reported as 04 Mar 1928. He was the son of Gustav Andreas Abraham and Agnes Stephanie Solem. Gerald Orris Abraham was baptized on 4 June 1928. He died on 24 January 2010 at age 81. He was buried after 24 January 2010 at Brule Creek Cemetery, Spink, Union, South Dakota, SSGT US AIR FORCE. Gerald Orris Abraham obtained US Social Security Card at South Dakota; last residence Las Vegas, Clark, Nevada. He was confirmed on 27 December 1942. He lived in 1967 at State Line, California. He lived in 1988 at Las Vegas, Nevada. Name Variation John Rudolph Clausen was also known as Claussen. Nickname John Rudolph Clausen also went by the name of Jack. John Rudolph Clausen was born on 10 August 1908 at Iowa. He was the son of John C. Clausen and Emma A. Schultz. John Rudolph Clausen married Eleanor Rosetta Abraham, daughter of Andrew Abraham and Lizzie Carrie Satter, on 14 August 1939 at Sioux City, Woodbury, Iowa. John Rudolph Clausen died on 20 May 1987 at Iowa at age 78. John Rudolph Clausen and Eleanor Rosetta Abraham lived in 1964 at Sioux City, Woodbury, Iowa. John Rudolph Clausen and Eleanor Rosetta Abraham lived in 1972 at Sioux City, Woodbury, Iowa. [S373] U.S. Federal Census 1940 U.S. Federal Census, by Ancestry.com, Year: 1940; Census Place: Sioux City, Woodbury, Iowa; Roll: T627_1215; Page: 1A; Enumeration District: 97-68. Name Variation Chester Ede Schatz was also known as Chet. Chester Ede Schatz was born on 19 December 1906 at North Dakota. He was the son of Edward W. Schatz and Maggie M. Warner. Chester Ede Schatz married Betty Louise Stearns circa 1928. Chester Ede Schatz married Florence Mildred Abraham, daughter of Andrew Abraham and Lizzie Carrie Satter, on 29 May 1947. Chester Ede Schatz died on 30 October 1975 at Hennepin, Minnesota, at age 68. Chester Ede Schatz obtained US Social Security Card at Minnesota; last residence Minneapolis, Hennepin, Minnesota. He and Florence Mildred Abraham lived in 1964 at Minneapolis, Hennepin, Minnesota. Chester Ede Schatz and Florence Mildred Abraham lived in 1972 at Minneapolis, Hennepin, Minnesota. [S250] U.S. Federal Census 1930 U.S. Federal Census, by Ancestry.com, ED27-73. Stamp 124. Dwelling 427. Name Variation Wayne E. Petersen was also known as Peterson. Name Variation Wayne E. Petersen was also known as Pete. Wayne E. Petersen was born circa 1920. He married Florence Mildred Abraham, daughter of Andrew Abraham and Lizzie Carrie Satter, on 7 November 1985 at Hennepin, Minnesota. Albert G. Anderson was born in October 1869 at Wisconsin also reported as South Dakota. He married Betsie Olson circa 1890. Albert G. Anderson died before 1910. [S245] U.S. Federal Census 1900 U.S. Federal Census, by Ancestry.com, Year: 1900; Census Place: Garfield, Sioux, Iowa; Roll: T623_459; Page: 3B; Enumeration District: 134. 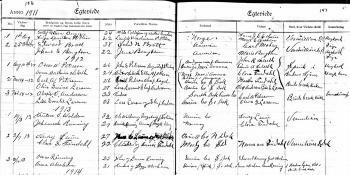 [S9] South Dakota, South Dakota Birth Records South Dakota, State File Number: 628341 (unknown file date). [S9] South Dakota, South Dakota Birth Records South Dakota, State File Number: 627454 (unknown file date). Name Variation Betsie Olson was also known as Betsey. Name Variation Betsie Olson was also known as Bessie. Name Variation Betsie Olson was also known as Betsy. Married Name circa 1890 As of circa 1890,her married name was Anderson. Betsie Olson was born in May 1871 at South Dakota. She married Albert G. Anderson circa 1890. Betsie Olson died after 1930. Betsie Olson had 5 with 5 living in 1900 children. [S244] U.S. Federal Census 1910 U.S. Federal Census, by Ancestry.com, ar: 1910; Census Place: Richland, Union, South Dakota; Roll: T624_1489; Page: 9B; Enumeration District: 0425; Image: 464; FHL Number: 1375502. [S250] U.S. Federal Census 1930 U.S. Federal Census, by Ancestry.com, Year: 1930; Census Place: Elk Point, Union, South Dakota; Roll: 2232; Page: 4A; Enumeration District: 8; Image: 111.0. Oscar Julius Ronning was born on 2 July 1890 at Alcester, Union, South Dakota. He was the son of John Ronning and Laura Solbue. Oscar Julius Ronning married Anna Gustine Abraham, daughter of Andrew Abraham and Lizzie Carrie Satter, on 2 October 1913 at Brule Creek Church, Union, South Dakota. Oscar Julius Ronning died on 13 May 1972 at Yankton St Hospital from Pulmonary Edemia, Uremia, Yankton, Yanktoon, South Dakota, at age 81. 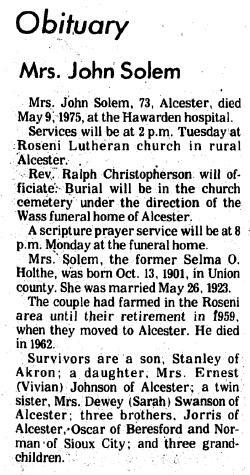 He was buried on 15 May 1972 at Roseni Lutheran Cemetery, Union, South Dakota. [S245] U.S. Federal Census 1900 U.S. Federal Census, by Ancestry.com, ED340. Dwelling 155. [S244] U.S. Federal Census 1910 U.S. Federal Census, by Ancestry.com, ED431. Dwelling 124. [S243] U.S. Federal Census 1920 U.S. Federal Census, by Ancestry.com, ED250. Stamp 253. Sheet 3A, dwelling 46. [S250] U.S. Federal Census 1930 U.S. Federal Census, by Ancestry.com, ED64-10. Dwelling 56. [S297] Mrs. Leo A. Abrahamson, The Abraham Olson Family - Second Edition, page 68. John Ronning was born on 13 June 1853 at Norway also reported as Jun 1852. He was the son of (?) Ronning. John Ronning married Laura Solbue circa 1889. John Ronning immigrated in 1873. [S184] Beresford Republic Newspaper, Vol. 50, 1943, Oct 28. Married Name circa 1889 As of circa 1889,her married name was Ronning. Laura Solbue was born in July 1868 at Norway. 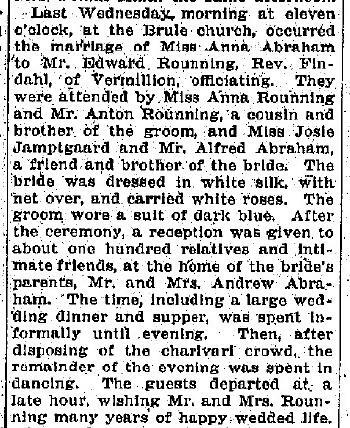 She married John Ronning, son of (?) Ronning, circa 1889. Laura Solbue died after April 1930. Laura Solbue immigrated in 1888. She had 3 with 3 living in 1900 children. Edward Martin Ronning was born on 25 October 1892 at Union, South Dakota. He was buried on 28 June 1983 at Roseni Lutheran Cemetery, Union, South Dakota. Edward Martin Ronning obtained US Social Security Card at South Dakota; Last residence Beresford, Union, South Dakota. He was a farmer. In 1965 Edward Ronnings observe 50th wedding anniversary on Sunday, September 26. About 250 relatives and friends helped Mr. And Mrs. Edward Ronning observe their golden wedding anniversary at the Roseni Lutheran church parlors on Sunday, Sept. 26. Mr. And Mrs. Orville Ronning and grandchildren of the honored couple hosted the event. He and Laura Kathrina Abraham lived in 1972 at Beresford, Union, South Dakota. [S297] Mrs. Leo A. Abrahamson, The Abraham Olson Family - Second Edition, page 69-70. [S243] U.S. Federal Census 1920 U.S. Federal Census, by Ancestry.com, ED250. Stamp 253. Sheet 3A, dwelling 45. Orville Marvin Ronning was born on 25 July 1918 at South Dakota. He was the son of Edward Martin Ronning and Laura Kathrina Abraham. Orville Marvin Ronning died in June 1981 at age 62. Orville Marvin Ronning obtained US Social Security Card at South Dakota; Last residence Beresford, Union, South Dakota. In October 1963 Mr. & Mrs. O. Ronning honored at open house for 50th anniversary. About 250 guests were in attendance at the Roseni Lutheran church on Sunday October 6, honoring Mr. And Mrs. Oscar Ronning for their golden wedding anniversary. The event was hosted by a nephew and wife, Mr. And Mrs. Orville Ronning, and other relatives… Mrs. Johnnah Gray, sister of the groom, and Mrs. Osborne Sandbert, were at the silver service. Mrs. Evelyn Jolin and Mrs. Jack Clausen of Sioux City cut and served the wedding cake. Orville Ronning and Osborne Sandbert took care of the cards and monetary gifts. All of the attendants of 50 years ago were present for the occasion… The honored couple received a congratulatory telephone call from Senator Karl Mundt and a telegram from Mayor Cruisenberry of Sioux Falls.4 In 1965 Edward Ronnings observe 50th wedding anniversary on Sunday, September 26. About 250 relatives and friends helped Mr. And Mrs. Edward Ronning observe their golden wedding anniversary at the Roseni Lutheran church parlors on Sunday, Sept. 26. Mr. And Mrs. Orville Ronning and grandchildren of the honored couple hosted the event. Married Name 26 May 1923 As of 26 May 1923,her married name was Solem. Selma O. Holthe was born on 13 October 1901 at Spink, Union, South Dakota, twin with Sarah. She was the daughter of Odin Holthe and Johanna Solberg. 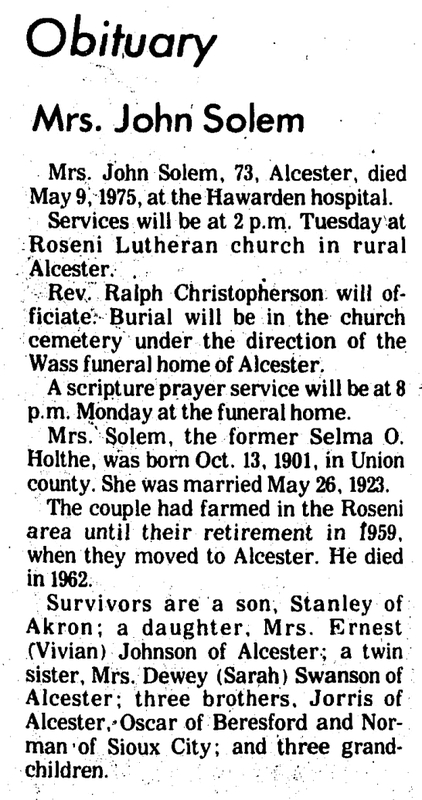 Selma O. Holthe died on 9 May 1975 at at hospital, Hawarden, Iowa, at age 73 Mrs John Solem (Selma O Holthe) obituary. She was buried on 13 May 1975 at Roseni Cemetery, Union, South Dakota. [S244] U.S. Federal Census 1910 U.S. Federal Census, by Ancestry.com, ED430. Dwelling 91. [S243] U.S. Federal Census 1920 U.S. Federal Census, by Ancestry.com, ED252. Dwelling 31. [S250] U.S. Federal Census 1930 U.S. Federal Census, by Ancestry.com, ED64-15. Dwelling 81. [S297] Mrs. Leo A. Abrahamson, The Abraham Olson Family - Second Edition, page 82. Name Variation Clara E. Anderson was also known as Johnson. 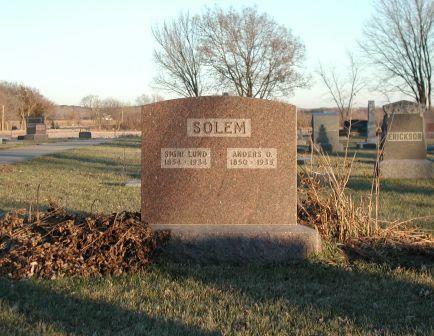 Married Name circa 1921 As of circa 1921,her married name was Solem. Married Name after April 1958 As of after April 1958,her married name was Rye. 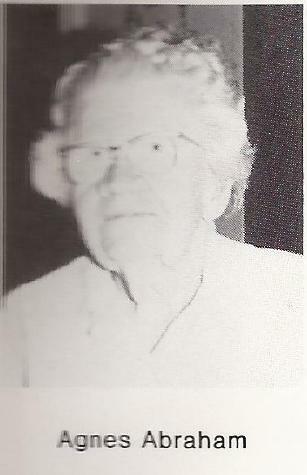 Clara E. Anderson was born on 27 July 1902 at South Dakota. She married Albert T. Solem, son of Thomas O. Solem and Anne Bolette Abrahamson, circa 1921 at first marriage for her. Clara E. Anderson married Clifford M. Rye after April 1958 at second marriage for her. Clara E. Anderson died on 15 November 1968 at Iowa at age 66. [S250] U.S. Federal Census 1930 U.S. Federal Census, by Ancestry.com, ED64-15. Dwelling 80. Name Variation William Walter Dale was also known as Wilhelm. William Walter Dale was born on 9 December 1887 at South Dakota. He was the son of Rev. Elling Olearius Dale and Inger Marie Iverson. William Walter Dale married Betsy Solem, daughter of Thomas O. Solem and Anne Bolette Abrahamson, on 26 October 1933 at Tyndall, South Dakota. William Walter Dale died on 13 May 1972 at Dakota Hospital of acute cerebravascular accident, Vermillion, Clay, South Dakota, at age 84. He was buried on 17 May 1972 at Bluff View, Vermillion, Clay, South Dakota. William Walter Dale was a laborer. He obtained US Social Security Card at South Dakota; Last residence Centerville, Turner, South Dakota.. On 5 June 1917 at World War I Draft Registration, Union, South Dakota. [S245] U.S. Federal Census 1900 U.S. Federal Census, by Ancestry.com, ED340. Dwelling 85. [S244] U.S. Federal Census 1910 U.S. Federal Census, by Ancestry.com, ED430. Dwelling 60. [S243] U.S. Federal Census 1920 U.S. Federal Census, by Ancestry.com, ED252. Dwelling 115. [S250] U.S. Federal Census 1930 U.S. Federal Census, by Ancestry.com, ED64-15. Dwelling 133. Name Variation Joseph Christopher Abraham was also known as Joe. Nickname Joseph Christopher Abraham also went by the name of John C.
Joseph Christopher Abraham was born on 10 July 1910 at Camp Cook (or Camp Crook), Harding, South Dakota. He was the son of Sever Abraham and Anna Olina Christensen. Joseph Christopher Abraham married Billie S. Ericksen on 27 June 1942 at East Stanwood, Snohomish, Washington. Joseph Christopher Abraham died after 1973. 1 April 1925 Elk Creek, Golden Valley, North Dakota Joseph Christopher Abraham appeared on the census of 1 April 1925 in the household of Sever Abraham at Elk Creek, Golden Valley, North Dakota. Joseph Christopher Abraham lived in 1964 at Stanwood, Snohomish, Washington. [S243] U.S. Federal Census 1920 U.S. Federal Census, by Ancestry.com, ED155. Stamp 255. Dwelling 72. Sheet 6A. [S250] U.S. Federal Census 1930 U.S. Federal Census, by Ancestry.com, ED17-10. Dwelling 26. Oliver Abraham was born after 1911. Oliver Abraham died before 1920 died in infancy. Married Name 4 November 1922 As of 4 November 1922,her married name was Abraham. Charlotte Doblar was born on 18 June 1903 at Money Creek, Houston, Minnesota. She was the daughter of Anthony Frank Doblar and Catherine Jane Munighan. 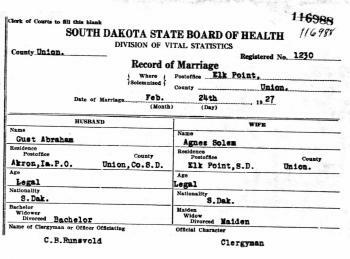 Charlotte Doblar married Olaf Ingaman Abraham, son of Sever Abraham and Anna Olina Christensen, on 4 November 1922 at Glendive, Montana. Charlotte Doblar died on 30 January 1941 at Beach, North Dakota, at age 37. She was buried in February 1941 at Beach Lutheran Cemetery, Beach, North Dakota. [S244] U.S. Federal Census 1910 U.S. Federal Census, by Ancestry.com, Year: 1910; Census Place: Township 142, Billings, North Dakota; Roll: T624_1138; Page: 7B; Enumeration District: 0010; Image: 1274; FHL Number: 1375151. [S243] U.S. Federal Census 1920 U.S. Federal Census, by Ancestry.com, ED64. Dwelling 55. [S250] U.S. Federal Census 1930 U.S. Federal Census, by Ancestry.com, ED17-4. Dwelling 3. Harold Sever Abraham was born on 6 March 1923 at North Dakota. He was the son of Olaf Ingaman Abraham and Charlotte Doblar. Harold Sever Abraham died on 21 November 1991 at age 68. Harold Sever Abraham obtained US Social Security Card at Montana; last residence not specified. He lived in 1964 at Beach, Golden Valley, North Dakota.